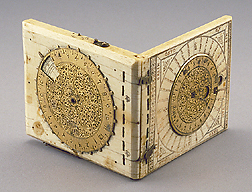 This very elaborate diptych dial, by the well known maker Paul Reinmann, contains a lunar volvelle, a wind rose, an equatorial dial, a pin gnomon dial, a vertical and horizontal string gnomon dial and a nocturnal. The horizontal string gnomon dial has further indications for Italian hours throughout the year. The equatorial pin gnomon dial for the winter on the inner surface of the upper leaf is now set incorrectly and the nocturnal on the outer surface of the lower leaf is incomplete.